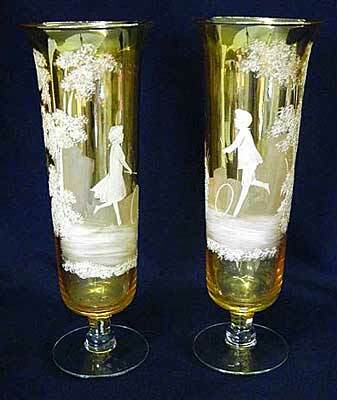 Mary Gregory (1856-1908) was an American artist known for her decoration of glass products at the Boston and Sandwich Glass Company in Cape Cod, Massachusetts. Her images were generally Victorian era children in profile. 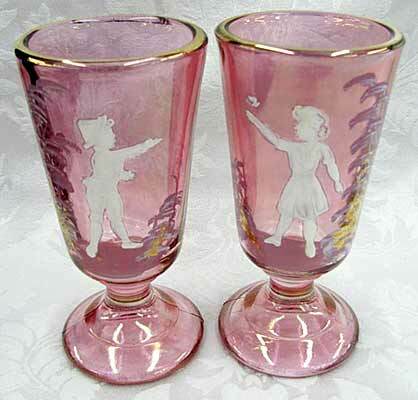 Westmoreland began marketing glassware with such images in the 1920s (though much of such glass was produced in Czechoslovakia) and the name Mary Gregory is still applied today to such images regardless of their origin. The set of 12-inch marigold vases on the left sold in 2013 for $140; the set of cranberry flashed glasses on the right sold for $25 in 2012. A wine bottle and two cordials sold in 2007 for $350. In 2016, a pair of cordials, in marigold, of a boy and a girl, sold for $200. Also in 2016, a cruet with stopper, 11 1/4-inch tall, in marigold, of a girl flying a kite, brought $35.